The theme of this week’s #SundaySupper is Beat the Heat – and I don’t know about you, but when I think about cooling off in summer a cold, refreshing cocktail is one of the first things that comes to mind. This classic daiquiri recipe fits the bill. With only three ingredients (rum, lime juice, and simple syrup) it’s clean and fresh, and oh so simple to make. The drink has a touch of sweetness from the simple syrup, and you can certainly add more to suit your taste. The bright, lightly astringent flavor of the lime juice shines through while not hiding the rum (so be sure to use good quality rum). Don’t even think about using bottled lime juice in this cocktail – you’d be better off mixing rum and bottled limeade and calling it a day. The fresh lime juice is essential here and adds only an extra minute of prep time. There aren’t too many variations on the recipe for a classic daiquiri except for when it comes to measurements. 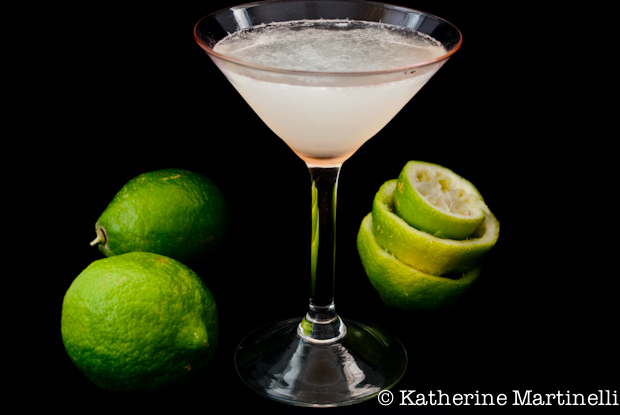 Most call for 1 1/2 to 2 ounces rum, 1/2 to 1 ounce fresh lime juice, and 1 teaspoon to 1/2 ounce simple syrup. I like mine with strong, with plenty of lime juice, and just enough simple sugar to make it go down smooth. You can start with these measurements and play around until you get a cocktail that’s perfectly suited for your taste. 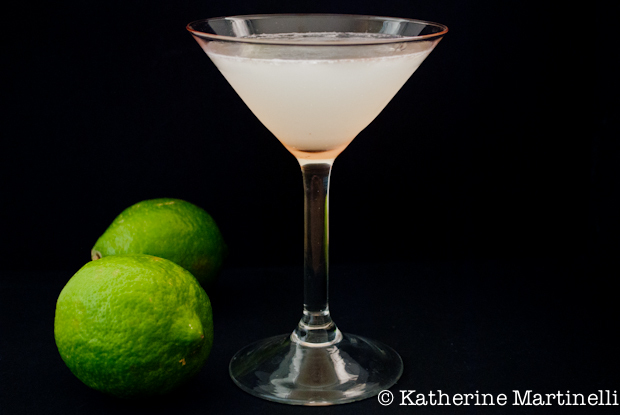 For some awesome notes and background on the classic daiquiri, head over to Kitchen Riffs for another recipe and some great information. This summery classic cocktail has only three ingredients: white rum, fresh lime juice, and simple syrup. Shake and enjoy! Put ingredients in a cocktail shaker filled with ice. Thanks to Juanita’s Cocina for hosting this week! See what everyone else is cooking up for this week’s #SundaySupper! What a list! A great resource for summer cooking. Join the Sunday Supperconversation today (July 15th) on twitter for more beat the heat inspiration. There will be a live chat 3:00 to 4:00pm Eastern Time. Use the #SundaySupper hashtag and tweet your own recipes and food photos. Follow the Pinterest board too. I love daiquiris! Can you believe I’ve never had one that wasn’t frozen? This looks fresh and tasty! Gorgeous photography! And gorgeous drink! Thank you for participating in this week’s #SundaySupper! I love all flavors of daiquiris! A daiquiri was the first drink I tried to order in a bar before I was legal. They actually served me at a place called “Daddy’s Money” (perfect name for a bar in a college town). Great pictures! Beautiful lighting. That’s not easy to do. Thanks for the mention of my daiquri post! By coincidence in a grenadine post today I talked about pomegranate molasses, and mentioned your Bulgar Salad with Pomegranate Molasses post! Anyway, totally love the pictures – great job. It looks so refreshing that I would love one RIGHT NOW! I have a great bottle of rum, and love drinks that don’t require loads of ingredients. You read my mind though because I was thinking about using bottled lime juice for this. Not anymore…that’s for sure! Oh yes! A light, fresh drink for summer. Thanks for sharing! Great pics of a classic! I personally love rum, and this is the perfect way to show it. I love this. I’m am not allowed alcohol but I might have to cheat for this one. So good. I like your drink proportions very much. I also appreciate a good amount of juice that’s just been touched by syrup. Your daiquiris look perfect. So refreshing and much more satisfying than the limeade kind. Thanks for the history! Looks great and daiquiris are probably our favorite drinks. We love them frozen in the summer and plain in the winter. A couple of tiny variations on the original (mint and a bit of Cointreau) elevates it immensely. What a simple and simply delicious daiquiri! This is definitely my kind of cocktail – simple and refreshing. I make something similar with lime, vodka and mineral water. I think a little simple syrup might make it even better. Oh, yeah…who needs ice cream when offered a cool, refreshing daiquiri! Perfect #SundaySupper Beat the Heat cocktail!!! it’s almost midnight and it’s still so hot. A refreshing cocktail would be perfect right now! This looks so much better than most of the dacquiris I see–love how you’ve styled the photos with the limes. This is a lovely grown-up drink. I love that you photographed it with limes! Great cocktail Katherine! I love a good daiquiri. Thanks for posting this. Will try it soon.